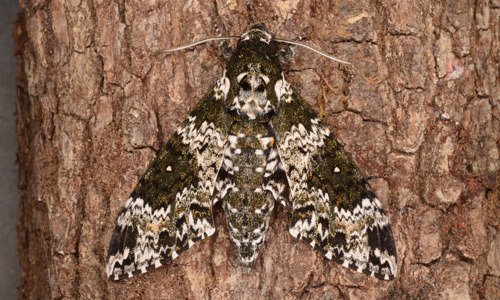 Manduca rustica, the rustic sphinx, is a moth in the Sphingidae family (Figures 1 and 2). 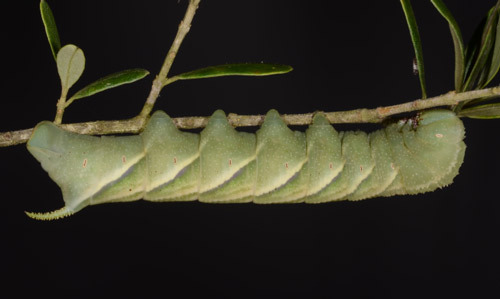 The moths in this family are called hawkmoths and the caterpillars are often referred to as hornworms, due to the horn-shaped protuberance found on their posterior end (Wagner 2010). Hawkmoths are nocturnal visitors of a wide variety of night-blooming flowers, pollinating these flowers while feeding with their long proboscises. It can be easy to mistake these moths for hummingbirds due to their flower visitation, relatively large body size, and fast, agile flying behavior. Figure 1. Adult rustic sphinx moth, Manduca rustica (Fabricius). Photograph by Lyle J. Buss, University of Florida. Figure 2. Adult rustic sphinx moth, Manduca rustica (Fabricius). Photograph by Lyle J. Buss, University of Florida. As well as being important for pollination, some sphingid species are economically important pests of major crops and ornamental plants. The most notable hornworm pests in this genus are the tomato hornworm, Manduca quinquemaculata, and the tobacco hornworm, Manduca sexta. These caterpillars are capable of defoliating their host plants and have been known to consume or damage developing fruit. Native to the southeastern United States, Manduca rustica can be found from southern Florida, north to Virginia and west to Arkansas, Texas, New Mexico, Arizona, and southern California, as well as south through Central America to South America, as far south as Argentina. Individuals also have been found as far north as Maine (Heppner 2003). 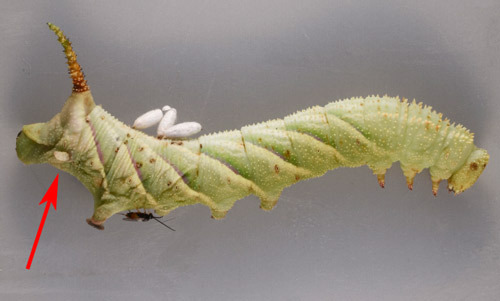 Larvae: Manduca rustica caterpillars closely resemble the more commonly encountered caterpillars of the closely related tobacco hornworm, Manduca sexta. The body is bright green with yellow diagonal stripes bordered with a darker green to purple-black (Figures 3 and 4). The posterior end bears a small protuberance or horn typical of hornworms. This horn has granulations that can help distinguish the rustic sphinx from other hornworm species that have a smooth horn. This color and pattern is maintained throughout all larval instars, until the final instar when the dorsal surface becomes a light reddish-brown (Genise et al. 2013) (Figure 4). This color change is most likely for camouflage, as the final instar caterpillar begins its passage to pupate in the soil. Figure 3. A caterpillar, known as a hornworm, of the rustic sphinx moth, Manduca rustica (Fabricius). Photograph by Lyle J. Buss, University of Florida. Figure 4. 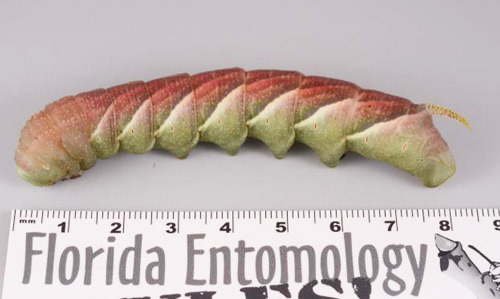 A late instar caterpillar, known as a hornworm, of the rustic sphinx moth, Manduca rustica (Fabricius), showing a characteristic color change that occurs prior to pupation. Photograph by Lyle J. Buss, University of Florida. 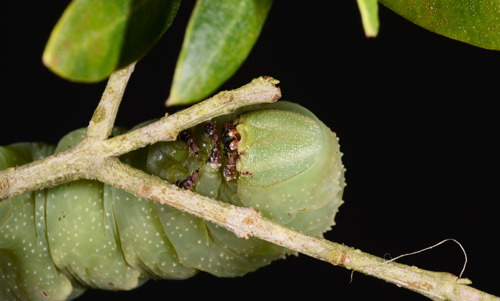 Larvae feed among the leaves and branches of the host plant, and can often be found in what is known as a sphinx position. This position is characterized by the posterior portion of the caterpillar flat against the substrate and the head and anterior portion curving upwards (Genise et al. 2013). This sphinx position is named for the caterpillar’s resemblance to the ancient Egyptian limestone statue called the Great Sphinx that depicts a mythical creature with the face of a human and body of a lion (Figure 5). The larvae feed on the host plant, growing and molting into subsequent instars. At the final instar, caterpillars will make their way to the ground by either crawling down the host plant or dropping to the soil to pupate (Genise et al. 2013). Figure 5. 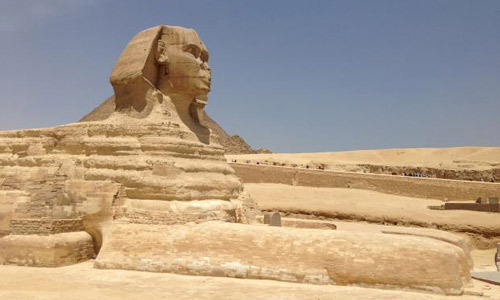 The Great Sphinx outside Cairo, Egypt. Photograph by Jennifer L. Gillett-Kaufman, University of Florida. Pupae: Manduca rustica larvae burrow into the soil and form pupation chambers after the final larval instar. The pupae have a maxillary loop that is diagnostic for the genus (Figure 6). Pupal chambers are formed just under the soil surface and have a convex, arched top and a flat bottom. On average, a pupal chamber is 2-3 cm larger than the pupa within it. This video shows a Manduca rustica final instar larva burrowing into the soil to form a pupal chamber (note the dorsal color change). 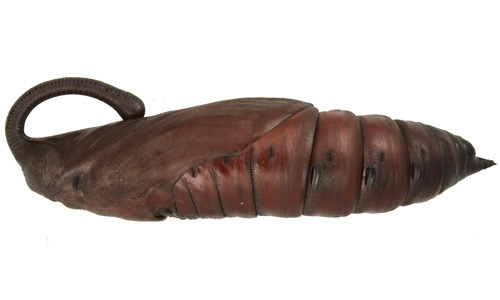 For a very detailed description of the Manduca rustica pupal chamber and a fascinating description of its resemblance to a fossil, see Genise et al. 2013. Figure 6. Pupa of the rustic sphinx moth, Manduca rustica (Fabricius), note maxillary loop. Photograph by Lyle J. Buss, University of Florida. Adults: Adult moths (Figures 1 and 2) have the typical sphingid body shape – a robust body that tapers posteriorly, with wide, angular wings. When at rest, hawkmoths fold their forewings over their much smaller hindwings, taking on a triangular shape. Many hawkmoths have cryptic markings on their wings that provide them camouflage and the rustic sphinx is no exception (Kitching and Cadiou 2000). 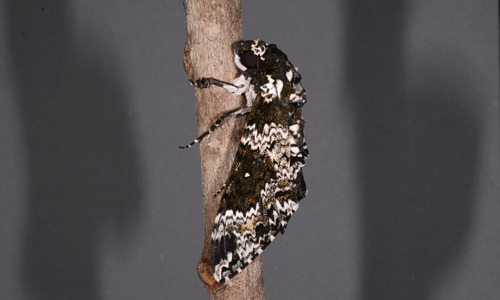 The wings are mottled with dark brown to black, medium brown, gray and white scales, giving the moth a resemblance to tree bark. The abdomen of the rustic sphinx is brown with segments separated by black lines with white markings, dorsally. The upper abdominal segments are bordered with a striking yellow-orange color, mostly visible in flight. Ventrally, the body is white to cream. The body of Manduca rustica is densely covered in short hairs, giving it a fuzzy appearance. Adults are nectar feeders and can often be seen visiting flowers at dusk and in the evening. Manduca rustica caterpillars have been reported on various ornamental plants (Genise et al. 2013). Host plants listed by Heppner (2003) include: Bignonia sp. (Bignoniaceae), Callicarpa americana (Verbenaceae), Chionanthus virginicus (Oleaceae), Fraxinus sp. (Oleaceae), Gardenia sp. (Rubiaceae), Helianthus annuus (Compositae), Heliotropium sp. (Boraginaceae), Jasminum sp. (Oleaceae), Lagerstroemia indica (Lythraceae), Lantana sp. (Verbenaceae), Ligustrum sinense (Oleaceae), Syringa vulgaris (Oleaceae), and Trichostema dichotomum (Labiatae). Recently, Gillett-Kaufman et al. (2015) have found the rustic sphinx defoliating trees on commercial olive (Olea europaea) farms in Florida (Figure 7). This is only the second report of their pest activity on a cultivated crop, the first coming from Venezuela where larval feeding damage on sesame (Sesamum indicum) was noted by Clavijo and Chacin (1992). Figure 7. A caterpillar of the rustic sphinx moth, Manduca rustica (Fabricius), feeding on olive. Photograph by Lyle J. Buss, University of Florida. Plants that attract hawkmoths are called sphingophilous, and they often have flowers specially evolved to have deeply sequestered nectar accessible only to hummingbirds and moths with long proboscises. Typically, moths are dotted with pollen on their head region while feeding deep inside the flower, spreading the pollen from flower to flower as they feed. Adult moths have been described as pollinators of many flowering plants, including shoals spider lily (Hymenocallis coronaria), woodland spider lily (Hymenocallis occidentalis), common evening primrose (Oenothera biennis), and large-flowered evening primrose (Oenothera grandiflora) (Graham 2010). They are also pollinators of some orchid species, notably Habenaria johannensis (Pedron et al. 2012). The parasitic wasp, Cotesia congregata, has been noted as a natural enemy of the rustic sphinx in Florida (Figure 8) (Gillett-Kaufman et al. 2015). Figure 8. A parasitized hornworm caterpillar of the rustic sphinx moth, Manduca rustica (Fabricius), with Cotesia congregata cocoons, emerging larva (red arrow), and adult wasp. Photograph by Lyle J. Buss, University of Florida. Acknowledgments: Identification assistance from: David Wagner, University of Connecticut, and Christopher Crockett, University of Florida. The authors would like to thank the President of the Florida Olive Council, Michael Garcia, for assistance locating producers and samples. We would also like to thank the following Florida producers for supplying samples and information on olive pests: Kent Cannon, Alachua County; Richard Williams, Florida Olive Systems, Volusia County; Rik Davis, Certified Crop Consultant, Volusia County; and Jonathan and Stephen Carter, Florida Olive Farms, Suwannee County. Brown JW, Donahue JP. 1989. The Sphingidae (Lepidoptera) of Baja California, Mexico. Journal of the Lepidopterists Society 43: 184-209. Clavijo JA, Chacín ME. 1992. Sphingidae (Insecta: Lepidoptera) reported as pests of Venezuelan crops: key to the species. Boletín de Entomología Venezolana 7: 119-125. Genise JF, Farina JL, Verde M. 2013. Teisseirei barattinia Roselli 1939: The first sphinx moth trace fossil from palaeosols, and its distinct type of wall. Lethaia 46: 480-489. Graham SP. 2010. Visitors to southeastern hawkmoth flowers. Southeastern Naturalist 9: 413-426. Heppner JB. 2003. Arthropods of Florida and neighboring land areas: Lepidoptera of Florida. Florida Department of Agriculture 17: 395-399. Kitching IJ, Cadiou J-M. 2000. Hawkmoths of the World: An Annotated and Illustrated Revisionary Checklist (Lepidoptera: Sphingidae). Cornell University Press, Ithaca, New York, USA. Pedron M, Buzatto CR, Singer RB, Batista JAN, Moser A. 2012. Pollination biology of four sympatric species of Habenaria (Orchidaceae: Orchidinae) from southern Brazil. Botanical Journal of the Linnean Society 170: 141-156. Tuttle JP. 2007. The Hawk Moths of North America: A Natural History Study of the Sphingidae of the United States and Canada. Wedge Entomological Research Foundation, Washington, District of Columbia, USA. Wagner DL. 2010. Caterpillars of Eastern North America: A Guide to Identification and Natural History. Princeton University Press, Princeton, New Jersey, USA. Publication Date: April 2016. Reviewed February 2019.